*Note: some items on the Cruising Ultimate Packing List are listed in multiple locations to ensure that they won’t be forgotten. Or you can personalize the list to fit your needs, make separate lists for each family member. Cruising Ultimate Packing List Tips to live by: Always bring less shirts than you think you need, and more underwear than you think need. Cruising Ultimate Packing List Tips to live by: Always put liquid containers in Zip-loc bags, you never know what might develop a leak. Cruising Ultimate Packing List Tips to live by: No matter the problem, a bandage is the answer for most kids, so bring enough! 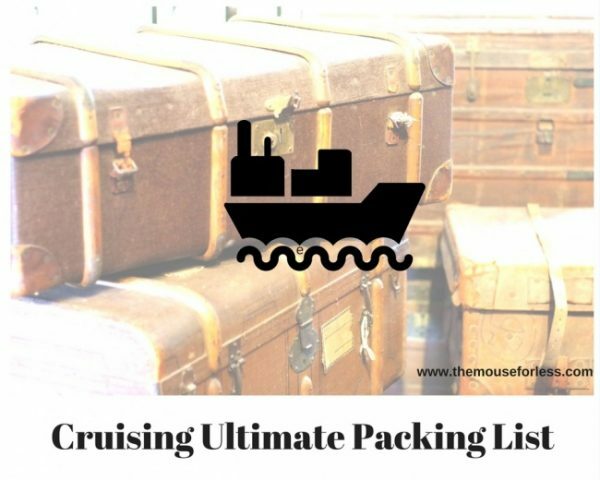 Cruising Ultimate Packing List Tips to live by: Always bring more sun block than you think necessary and put it on more often than you think necessary. Cruising Ultimate Packing List Tips to live by: Find out if there will be food and drink served on the flight so you know how many snacks to pack. Remember the restrictions on bringing liquids through security. Beverages will not be allowed through security. Cruising Ultimate Packing List Tips to live by: Always bring all available games for the hand held. Save space by using multi-purpose USB plugs with us connectors. Tips to live by : Keep all your important records in your passport pouch with you. Keep a copy of each document in a separate bag and keep at least one more copy of all records with someone who can fax/email the records to you if your originals and copy should be lost through emergency. Looking for more information on cruising with Disney? Check out our Disney Cruise Line section.